Perforated 11½ and imperforate, wove paper, no watermark, lithographed. Printed by the Office for the Production of Fiduciary Papers at Novocherkassk. All 11 denominations (Scott #61 - 71) were prepared and printed together in April of 1919. 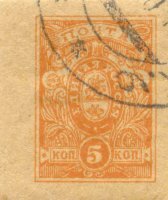 However, supplies of the ruble denominations (Scott #66 - 71) were withheld until stocks of existing Arms stamps were nearing exhaustion (around the middle of July), making the kopecks effectively the first issue. The earliest known date of use is May 8. These were printed by authority of the Special Conference on South Russian Government (the only White faction able to secure western assistance), and issued to keep the postal system supplied with stamps it would otherwise have run out of. The kopecks were printed by the Office for the Production of Fiduciary Papers (many translations of this Russian phrase are possible) of the All-Great Army of the Don at Novocherkassk, in sheets of 400 subjects : the 25-stamp (5 X 5) panes were arranged 4 X 4, with imprint (inverted) over panes A & B. These printers' sheets were then quartered into office sheets of 100 (a few of which survive intact). The first printing (made via direct, stone lithography) can be recognized by its thin framelines and fine detail. Gum on the initial printing was often more like a thin, brown glue which soaked into the paper. By late 1919 (November) these had been printed in prodigious numbers, with (due to wartime shortages) a wide variety of papers, inks and gums. Although some of these are rarities, mint remainders of the issue as a whole are easily and cheaply available - almost wallpaper. Postally used examples, however, are very scarce items which provoke spirited competition when (infrequently) offered at auction. The quantities of #68, 69 and 71 include the (small) number of perforated stamps. It is very probable that a large quantity of the third printing was destroyed when the Red Army entered Novocherkassk in December 1919.